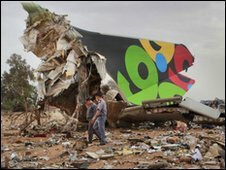 At least one Briton was killed when an Airbus crashed in Libya, killing more than 100 people on board. The Afriqiyah Airways flight from Johannesburg crashed at Tripoli International Airport with 93 passengers and 11 crew on board. Afriqiyah Airways said two Britons died in the crash, although the Foreign Office has been unable to confirm this so far. Concerned relatives should call +44 20 3355 2737. Some passengers were booked to connect to Europe, including seven to Gatwick, South African air officials said. Foreign Secretary William Hague said he was "greatly saddened" by the crash. "It is now clear that one of the victims was a British national. Our deepest sympathies are with the families and friends of all those who lost their lives," he said. "We are continuing urgently to clarify whether any other British nationals were on the flight. We stand ready to offer emergency consular assistance." The British Embassy in Libya said it had a consular team at the crash scene, but it had no information, as yet, of any other British passengers. Officials were trying to get hold of a copy of the passenger list, a spokesman added. The passengers on board the Airbus 330 are believed to be of various nationalities, including British, Dutch and South African. One Dutch child that survived is being treated in hospital for injuries including broken bones, Libyan officials said. Dutch officials say 61 of their nationals were killed. The BBC's Rana Jawad in Tripoli says it was not clear whether the plane was on the runway when it crashed, but people at the airport told her they could not see the plane. Afriqiyah Airways said 58 Dutch passengers, six South Africans, two Britons, two Libyans, two Austrians, one German, one French national and one Zimbabwean were on board. The nationalities of 19 other passengers has not yet been confirmed but the airline said the 11 crew were all Libyan. A statement on the airline's website said: "Afriqiyah Airways confirms as per the information received from the Libyan authorities the death of the 103 passengers on board flight 8U771 from Johannesburg to Tripoli May 12, 2010. Only one survived the accident (a Dutch child)." The Foreign Office said Afriqiyah Airways Flight 8U771 from Johannesburg had been due to land at 0610 local time (0410 GMT) and the plane crashed close to the airport. A Foreign Office spokesman said: "Libyan officials have informed us that Afriqiyah Flight 8U771 from Johannesburg crashed at Tripoli International Airport. "Afriqiyah Airways have set up a helpline for those concerned about relatives." Are children more likely to survive plane crashes?